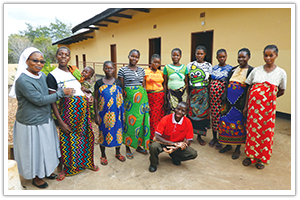 In rural Zambia, many poor women give birth at home without health care because there are no hospitals or medical clinics in their area. This leads to an increased risk of infections and life-threatening complications for both mothers and their babies. To meet this need, the Borromeo Sisters run the St. Joseph’s Health Center, where expectant mothers can receive prenatal care and stay at a shelter before, during and after labor. With your help, we can help mothers welcome happy and healthy babies into the world! Click here for more info.